Laman, an affiliate of the Department of Organismic and Evolutionary Biology, typically woke well before dawn to search the tropical forests of Papua New Guinea, Indonesia, and Australia for some of the world's most spectacular creatures: birds of paradise. During 18 expeditions over eight years, he rose in the dark, hiked in the dark, and even climbed trees in the dark, all in order to get in place before the birds started the elaborate courtship displays for which they are famous. 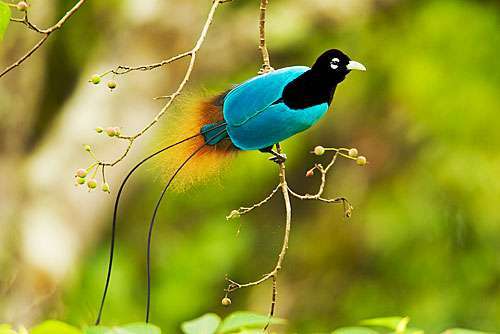 "Tim has just accomplished what so many ornithologists—including myself—can only dream about—to actually observe and record the behaviors of the entire diversity of birds of paradise," said Scott Edwards, a professor of organismic and evolutionary biology, Alexander Agassiz Professor of Zoology, and curator of ornithology in Harvard's Museum of Comparative Zoology. "This is a truly extraordinary feat, and the fruits of his labor will be a great benefit to both scientists and the general public." 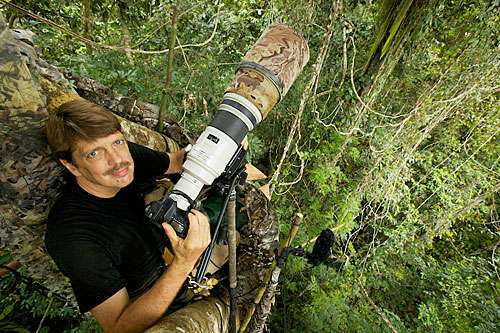 Laman, who began photographing the rain forest during his doctoral work, first shot the birds in 2004 on an assignment from National Geographic magazine. It took several field seasons to complete the article, which was published in 2007. When it was done, Laman said, he and Scholes, the field scientist he'd been working with, decided to push on and try to document every bird of paradise species. "It's striking how little research was going on about them," Laman said. 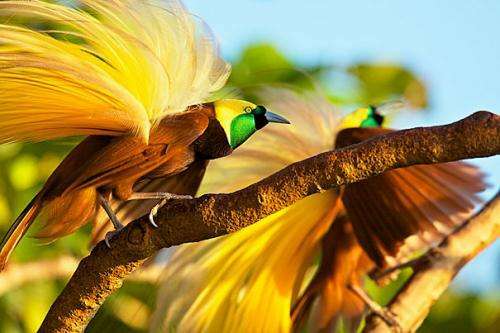 The two received funding from National Geographic, which this year published a book on their efforts, "Birds of Paradise: Revealing the World's Most Extraordinary Birds." The book, complete with full-page photographs, shows the dazzling variety of color, shape, and texture in the birds' plumage, from the almost impossibly long tail feathers of the ribbon-tailed astrapia, to the hairlike tail feathers of the twelve-wired bird of paradise, to the puffy yellow cloaklike plumes of the greater bird of paradise. 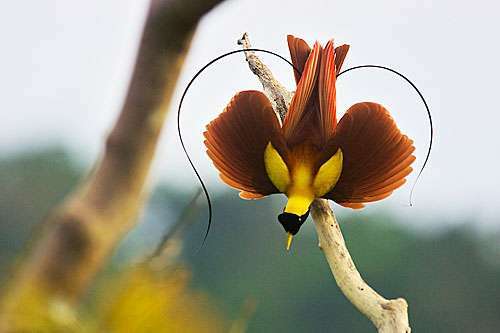 "Ducks all kind of look like ducks, but birds of paradise have this incredible variety of forms," Laman said. Each expedition took four to six weeks, Laman said. He typically rose before dawn so it would still be dark when he reached a blind near a site where males displayed regularly. He'd observe and photograph the males' displays for several hours before heading back to camp. He'd return to the blind in the late afternoon to catch the evening displays before wrapping up for the night and returning to camp for dinner, a wash in a nearby stream, and a chance to download photos to his laptop. "The type of resource that Tim is collecting—high-quality digital photographs and video—will rapidly become as essential to integrative biological inquiry as traditional museum specimens have been," Edwards said. "These are the collections of the future and like all collections need to be curated with care." More information: To view a time-lapse video of Tim Laman unpacking and repacking all of the gear necessary to complete his work in the field, visit his website.